This spring we have received a number of questions regarding the use of glyphosate-based burndown herbicides programs with ATS (ammonium thiosulfate). Increased use of ATS is being driven by the fact that sulfur deficiency symptoms are showing up on fields with low sulfur soil test levels. It is our understanding that ATS is a low cost source of sulfur to help rectify sulfur deficiency. Because of the number of questions we were receiving, we conducted a quick study in the greenhouse to determine the impact ATS has on weed control with glyphosate and glyphosate plus 2,4-D.
We chose to evaluate wheat, velvetleaf, and lambsquarters, because these weeds are known to be tough to control with glyphosate. In this article, we will discuss wheat control. Our treatment structure and results are shown in Figure 1. 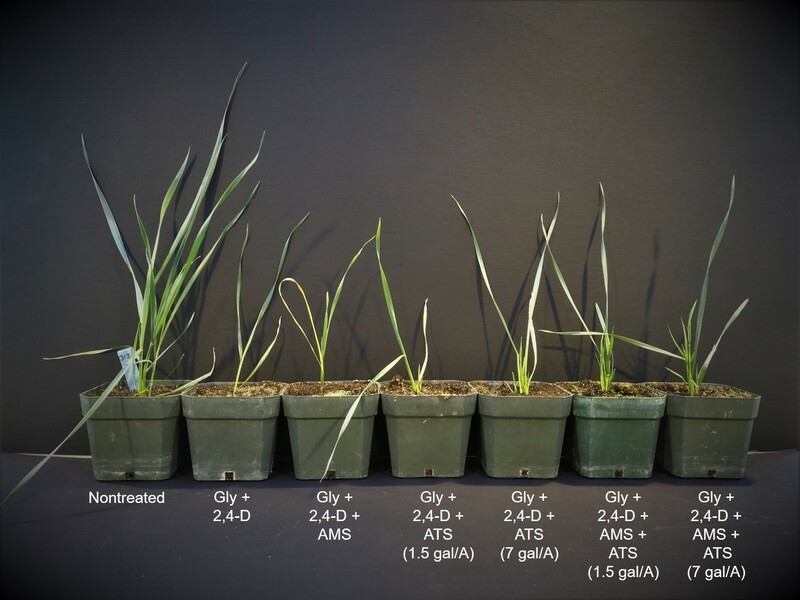 Figure 2 shows wheat control 11 days after application. 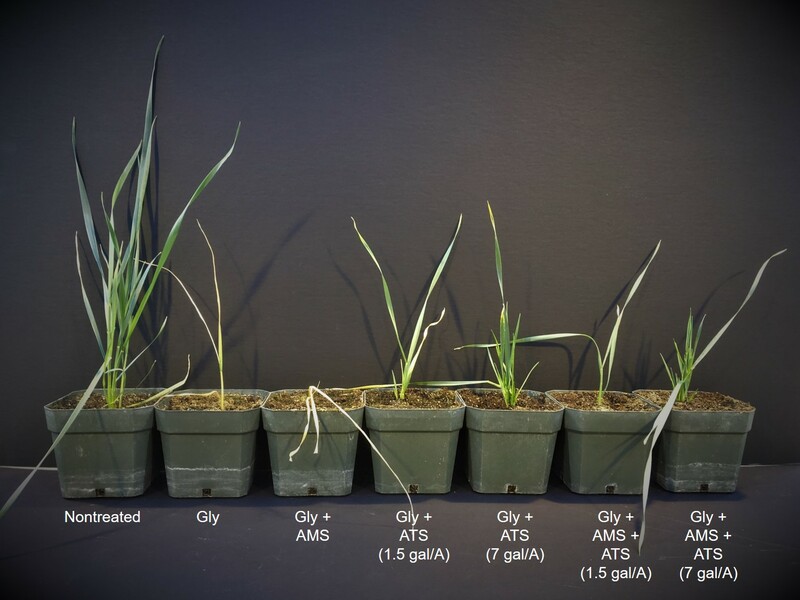 As you can clearly see in the figures, use of ATS with glyphosate resulted in lower control of wheat in this greenhouse study. To translate what this would mean in the field, the potential for control of weeds or cover crops like wheat, annual ryegrass, barnyardgrass, velvetleaf, lambsquarters, marestail, etc. 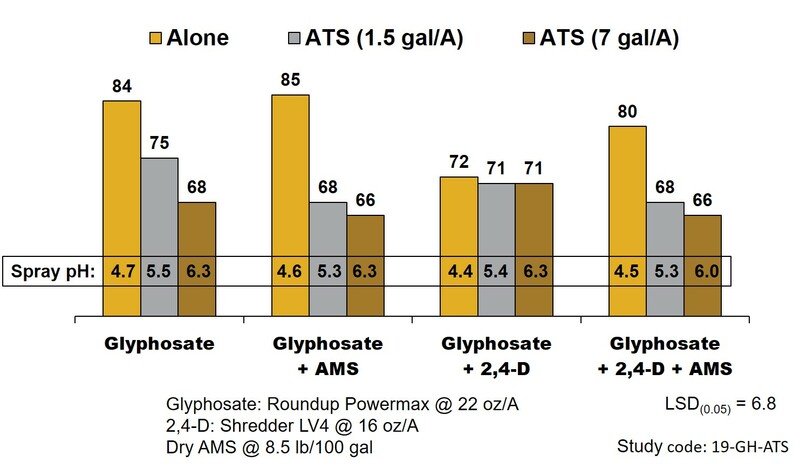 could be lower or result in incomplete kill if ATS is used with a burndown herbicide program that relies on glyphosate or glyphosate + 2,4-D. This situation is more likely to occur when the weeds are large, or when spray applications are made to plants that are not actively growing (e.g. cool, cloudy weather conditions for many days surrounding spray day). Please note this research included full rates of both glyphosate and 2,4-D under warm greenhouse conditions that favor herbicide activity. We also recorded the pH of the spray solution prior to application and noted that ATS applied at a high rate of 7 gal/A increased the pH by approximately 1.5 pH units. Since we don’t currently understand the basis for the antagonism between glyphosate and ATS, we can’t suggest that this change in pH is the primary cause of reduced efficacy or that reducing the pH with an adjuvant that reduced spray pH will restore glyphosate activity. 3) Consider adding another effective mode of action to glyphosate for control of weed species that are historically difficult-to-control in a spring burndown with glyphosate. In our next article we will discuss velvetleaf control. The symptoms were slower to develop on velvetleaf and we wanted to allow a few more days to pass before we made our assessment.